The event taking place in Dushanbe, the capital of Tajikistan, is momentous on all accounts. Official representatives of Central Asian countries, Germany, Afghanistan, and Pakistan participate in the conference "Germany - Central Asia: partnership for security strategies". The conference is taking place behind the closed doors which is hardly surprising considering that the guest list is restricted to the heads of security structures. Their colleagues from Russia, China, France, Italy, Canada, United States, Great Britain, and Ukraine participate as observers. Representatives of international organizations (Interpol, UN Development Programme, OSCE, and European Union) are present too. According to some reports, the idea of the conference belongs to the Germans. The forum itself was organized by the German criminal police together with the Tajik National Security State Committee, Interior Ministry, and Drug Enforcement Agency. Selection of participants was restricted to the directly involved. Expected activeness of Talib gunmen on the borders of Uzbekistan and Tajikistan cannot help being a matter of grave concern for security structures of Pakistan, Afghanistan, Central Asian countries, and Germany. Northern provinces of Afghanistan are policed by Bundeswehr units which is common knowledge. German military base is located near Termez, a city in Uzbekistan near the Afghani border. Secret services of the two countries are quite reasonably determined to try and evaluate the scale of threats and work out counter-measures. Save for the 1920's and 1930's, the Soviet-Afghani border has always been diligently watched. When the Soviet Union deployed the so called "limited contingent" in Afghanistan, the hostilities mostly took place in the southern provinces, the ones weapons and munitions were smuggled to from Pakistan. Once the USSR disintegrated, the border was manned by friendly members of ethnic communities that, also importantly, depended on neighbors. Everything changed this summer when Central Asian republics joined the so called northern route of NATO logistics network. The Talibs reiterated with the first operations in the area, actions indicating their willingness to bring war to the region. Afghani General Mustafa Patang, the 393rd Army Commander, told journalists in late September that hundreds of gunmen from the Pakistan's tribal zone had come to the northern provinces of Afghanistan. According to some reports, they had crossed the border in unidentified helicopters. All specialists agree that the Talibs, determined as they are to disrupt the NATO's logistics chain, use foreigners, people from the Central Asian countries who know the future theater of operations. Besides, gunmen may even use the routes taken by caravans with drugs detouring border checkpoints and outposts in Central Asia itself. 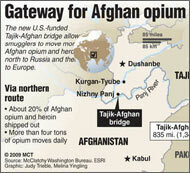 It follows that drug trafficking is now inseparable from security of shipments to NATO contingents in Afghanistan. That the international community is not entirely blind to the problem is proved by the conference under way in Dushanbe, one that considers the problems of drug trafficking and regional security together. Not that appropriate structures have never tackled the former problem, of course, but despite NATO's claims, production of drugs in Afghanistan has never topped its list of priorities. According to Victor Ivanov of the Russian Drug Enforcement Federal Service, Afghani peasants increased bulk of poppy production 44 times in the seven years of the international operation in Afghanistan. With the counter-terrorism coalition purporting to police its territory, Afghanistan became an unquestionable monopolist in this sphere. Lion's share of the stuff is smuggled to the Central Asian republics up north, due to the problems on the Pakistani border (military operations in the already mentioned tribal zone) and stiff measures taken by the Iranians (fortifications on the border and gallows for traffickers). What is good for drugs is also good for gunmen. Appearance of armed men in Central Asia this spring and summer raised no questions concerning how they had made it to the Tajik mountains and Kyrgyz territory prior to ending up in Uzbekistan. Everyone knows after all that pathways across the border are open to all. Gunmen of the Islamic Movement of Uzbekistan took them a decade ago to cross from Tajikistan to Kyrgyzstan in the course of the raid into Batken. Since gunmen were sighted on the Kyrgyz-Tajik border this spring and summer, the paths remain out of security structures' control. Is there anyone foolhardy to believe that gunmen will restrict their activities to border areas? The task Talib commanders outline for foreigners (disruption of NATO's logistics chain) does not prevent them from going after other objectives that promote their own interests. Summer attacks on police patrols in Andijan and skirmishes in Tashkent itself (pointless at a casual glance - indeed, what's the point in taking out several police officers?) gain importance when one considers them from the standpoint of analogous incidents in Pakistan and throughout the Caucasus. Attacks such as these are expected to disorganize law enforcement agencies and shake the regimes. Religious authorities that support central governments and speak against the so called Wahhabi are another target for gunmen in the Caucasus. Abror Abrorov, Assistant Director of Medrese Kukeldash assassinated earlier this year, and Anvar-kori Tursunov, preacher and Tashkent's senior imam-khabib who survived an attempt on his life, had spoken against the Wahhabi. Colonel Hasan Asadov of the Uzbek Interior Ministry's Terrorism and Corruption Department, who investigated the attempt on Tursunov's life was murdered... Before this episode, Uzbekistan had never known anything like that in connection with religious celebrities or senior officers of the police. And yet, gunmen failed in both Uzbekistan and Tajikistan which is an indication of their weakness on the one hand and stability of the regimes on the other. Unlike Pakistan or republics of the Caucasus, these countries lack infrastructure for guerrilla warfare - bases and hideouts, caches with weapons, countless accomplices supplying food and information on government troops... All of that renders futile all efforts to take the war into these republics. Considering the open borders between Central Asian countries, gunmen representing the Islamic Movement of Uzbekistan and other organizations might and probably will repeat actions against law enforcers there. And yet, it is the northern provinces of Afghanistan where gunmen have both bases and access to munitions that are bound to become the principal theater of operations.